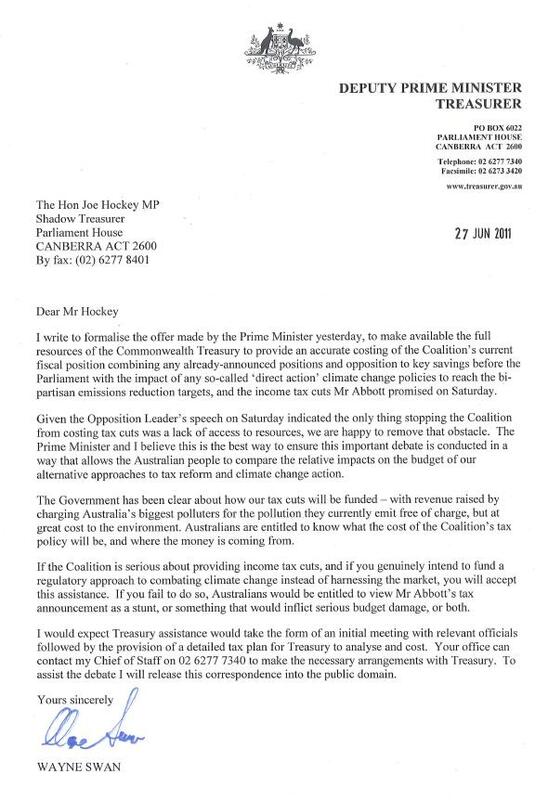 I write to formalise the offer made by the Prime Minister yesterday, to make available the full resources of the Commonwealth Treasury to provide an accurate costing of the Coalition’s current ﬁscal position combining any already-announced positions and opposition to key savings before the Parliament with the impact of any so-called ‘direct action’ climate change policies to reach the bipartisan emissions reduction targets, and the income tax cuts Mr Abbott promised on Saturday. Given the Opposition Leader’s speech on Saturday indicated the only thing stopping the Coalition from costing tax cuts was a lack of access to resources, we are happy to remove that obstacle. The Prime Minister and I believe this is the best way to ensure this important debate is conducted in a way that allows the Australian people to compare the relative impacts on the budget of our alternative approaches to tax reform and climate change action. The Government has been clear about how our tax cuts Will be funded — with revenue raised by charging Australia’s biggest polluters for the pollution they currently emit free of charge, but at great cost to the environment. Australians are entitled to know what the cost of the Coalition’s tax policy will be, and where the money is coming from. If the Coalition is serious about providing income tax cuts, and if you genuinely intend to fund a regulatory approach to combating climate change instead of harnessing the market, you will accept this assistance. If you fail to do so, Australians would be entitled to View Mr Abbott’s tax announcement as a stunt, or something that would inﬂict serious budget damage, or both. I would expect Treasury assistance would take the form of an initial meeting with relevant ofﬁcials followed by the provision of a detailed tax plan for Treasury to analyse and cost. Your can contact my Chief of Staff on 02 6277 7340 to make the necessary arrangements with Treasury. To assist the debate I will release this correspondence into the public domain.